American Pitbull, also known as the American Pitbull Terriers are dogs share their ancestry with bulldogs and terriers. Not many people are aware of the fact that this breed was originally trained as a fighting dog and with time, evolved as a companion dog and excellent pets for children. This otherwise aggressive breed is an excellent choice for families because of their loyalty to their humans and friendliness towards strangers. However, if these dogs are not trained they can be quite stubborn and tough to handle. Once trained, you can get the American Pitbull to perform many activities like taking part in competitive dog sports and even be used in search and rescue operations. The history of breeding as well as the physical and behavioral characteristics of this breed is outlined below. People are often curious to find where the name “pitbull” came from. The history of pitbulls is an interesting one. As mentioned earlier, this breed evolved because of breeding between fighting bulldogs and agile terriers so that a canine could be developed that would ideal for the sport of ratting (which developed from the sport of “baiting”). Baiting was initially developed by butchers, who kept ferocious bulldogs to train bulls that had to be taken to the market for slaughter. With time, it slowly developed into a popular sport with the masses who enjoyed watching these dogs “bait” bulls, bears, horses and several other animals. When baiting became an illegal sport, these dogs were used for ratting, in which people watched these dogs attack smaller animals like rats. Instead of a large baiting ring, this sport was conducted in pits, hence the name “pit” bull. The role of pitbulls spread with the immigrants who took these dogs with them when they travelled from England to America. The agility and aggressiveness of this breed became a useful asset to farmers who used them for herding their livestock and protecting them from wild animals and other dangers. Pitbulls are now considered as faithful companions of humans and have shown their loyalty as home pets, police search dogs and therapy dogs. The American pitbull or Bull terriers are medium-sized with the toned and muscular structure. The height of this breed ranges form 46-60 cm and weighs anywhere between 14-27 Kg. Its eyes are in the shape of an almond and ears can be small or medium in length. 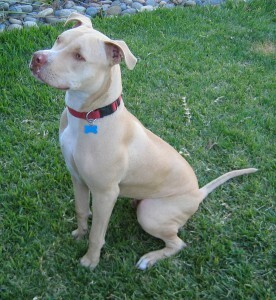 Pitbulls have a thick, short and shiny coat of hair, which can vary in color. The lifespan of Pitbull terrier is considered about 12 years. A trained Pitbull is a good-natured and obedient animal that shows a high level of affection towards children and seeks a lot of attention from its owners. Because if its high intelligence, it is used both as a working dog and as a companion. It is widely used in rescue operations and used as police or armed service dogs. This breed is a very muscular and overall a healthy one, but occasionally suffers from health conditions like congenital heart disease, cataracts and hip dysplasia. Some breeds that have a lighter coat color are also prone to suffer from skin allergies. The pitbull needs vigorous exercise and should be taken for long walks every day. The different activities that these athletic dogs are commonly used for include: · Sports like weight pulling, fly balls and obedience competitions · Search and rescue operations · Detection of explosives and drugs · Hearing dogs for deaf people. People who wish to keep pitbulls as pets should start dog training when it is as young as 3 weeks old. Some of the training tips include having specific meal times for the dog, ignoring behavior that is aggressive or demanding and rewarding the dog with praise or treats only when it deserves it. Laying down these rules is important for the animal and pet-owners need to be both committed and patient throughout the training process. Once trained, the American pitbull wins the hearts of its families and becomes a cherished member of the family. To train your American pit bull try out the Pit Bull Training Guide to get fast and easy results with your dog training.